This guide will explain how to connect your Amazon Redhsift instance to Blendo in order to ETL and data warehouse your data. Not an instance yet? Read how to setup an Amazon Redshift instance. If you have problems connecting check again your access permissions by reading how to setup the Amazon Redshift permissions in our documentation. 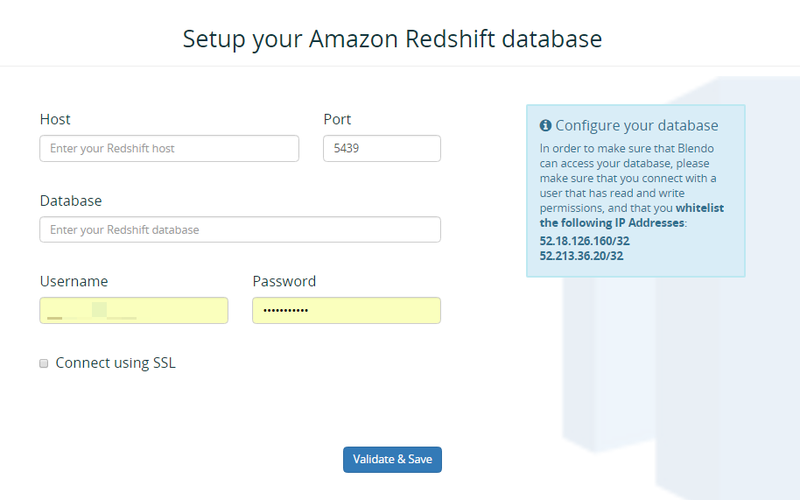 It will take only a few minutes to connect and send your data to Amazon Redshift. 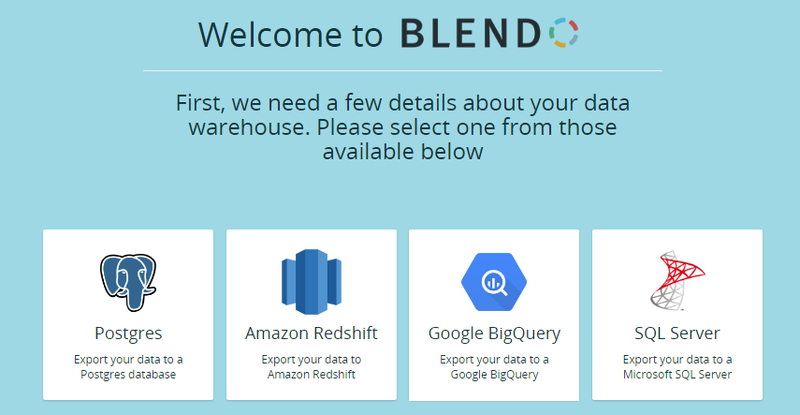 Blendo makes it easy to send your transactional, customer, marketing and sales data to any data warehouse like Google BigQuery, MS SQL Server or PostgreSQL. A Blendo Output is any destination that you want to send your data to. 1. Go to your Blendo Dashboard. 2. If it is the first time you login to Blendo you will see the screen bellow. Click on the box with Amazon Redshift. If it is not the first time, you will see the screen bellow. Click the drop-down arrow and then click on Add database. 3. Add your credentials to connect to Amazon Redshift. 4. Click Validate & Save. You can also select the Schema where the data will be stored to. This is something that is done during the setup of your data warehouse but instead during the creation of a pipeline. There you can select at which Schema the data from source will be stored at (with public schema as default). You may now connect data sources with it. Blendo will sync all your data from these data sources into your data warehouse.